Shinobu Kaitani’s One Outs, the story of ace player/owner of the Saitama Lycaons, Tokuchi Toua, is without question the best in an increasingly long list of baseball series I have read to date. It’s set in a professional level, and much like Giant Killing, it features everything that makes pro sports so interesting; contract disputes, arcs of victory and defeat over a long season, and players who are all at least nominally in the top 5% talent-wise (even if the Central and Pacific Leagues are kind of a few miles below the AL and NL). The difference between the two is that where Giant Killing chooses to attack pro sports with realism, One Outs chooses to fight with showmanship. Toua forgoes all the traditional principles of baseball, getting opponents out at a historic rate with only a slowball/slider and a heaping helping of quick wit in his arsenal. Eventually, a combination of his dominance on the plate and his harsh but performance-based contract makes him filthy rich, and puts him in position to buy out the team his contract bankrupted. And that’s where the real fun, him leading his lackluster team to the pennant, starts. 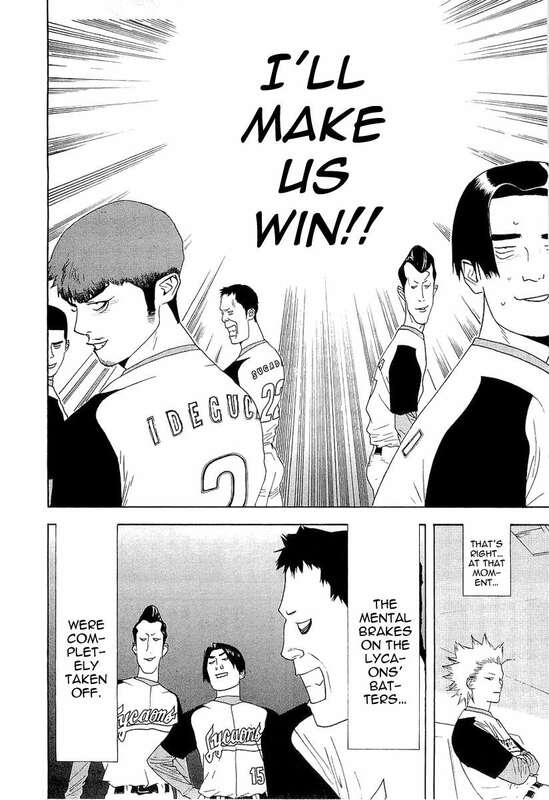 The chapter in question is a part of the Lycaons’ quest for the pennant, as they duke it out with a hilariously top-heavy first-place Mariners team. So the Lycaons step up to the plate and overwhelm the hapless Mariners reliever, scoring 4 runs like clockwork, setting a stage for a come-from-behind tie game. I’m so glad this is being scanlated in October. Particularly this October. *Pirates knocked the Reds out of the playoffs Tuesday night, thanks in large part to warrior god of catching Russell Martin and in small part to Baker not playing the team’s best closer, Aroldis Chapman, when things got hairy. This entry was posted in Chapter of the Week, Manga and tagged Baseball, Chapter of the Week, Giant Killing, Manga, One Outs, Shinobu Kaitani, Sports, Sportsfan by torisunanohokori. Bookmark the permalink.